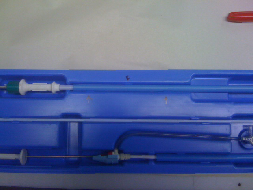 We specialize in making long thermoform trays for long medical devices like catheters, and endoscopy products. We can make trays up to 48 by 72 inches. A long straight package prevents the catheter from taking a ‘set’ if it is packaged in a coil while it is sterilized. We can manufacture rigid trays in a one-piece rigid trays up to 72 inches in length. We can also assist in the design of thermoform trays, and have internal mold making capabilities. We can also provide samples thermoform trays with sealed Tyvek lidding for evaluation purposes. 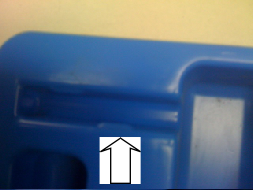 Components in the tray - please note the arrow on the tray shows the location of ‘undercuts’. The ‘undercuts’ are sections where the tray will ‘hold’ the cylindrical parts of the introducer sleeve in the tray. We can also supply Tyvek pouches for catheters, sizes up to 72 inches. Clean film is Nylon for added strength.